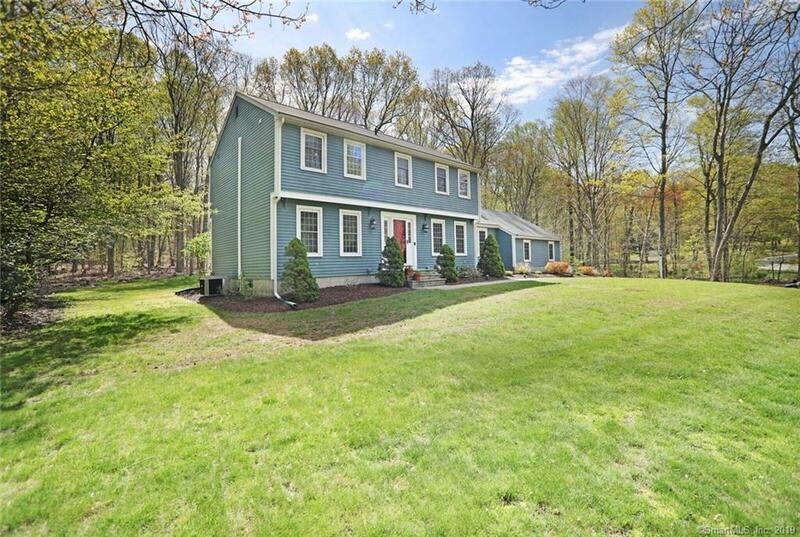 This Classic 4-bedroom Colonial is situated on a lightly wooded level lot in a cul-de-sac neighborhood surrounded by open space owned by the Madison Land Trust. Numerous upgrades make for a move-in ready home. This home offers a custom kitchen with stainless steel appliances and granite counters, hardwood floors throughout and updated bathrooms. The downstairs bath has been fully-renovated and the upstairs hallway bath includes heated tile floors and a granite vanity top. The master bedroom has a large walk-in closet and full bath en suite. There are three additional light-filled bedrooms. The main floor offers a formal living room and dining room plus a family room with a fireplace. The screened-in porch and patio will extend your ability to spend time outdoors. The lawn and gardens are on a level lot which allows for many outdoor activities. In addition, the home features new thermopane windows, a new boiler, new central air conditioning and a whole-home Generac automatic generator. All this in a desirable neighborhood and a great location close to Guilford and Madison.